Some people might try to convince you that video games are a waste of time. Here's the perfect retort. 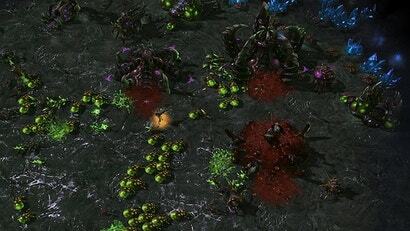 Researchers at Simon Frasier University have concluded that games like StarCraft II improve players' multitasking and cognitive skills, the Wall Street Journal reports. The researchers studied the behaviour of 150,000 people who played Blizzard's popular real-time strategy game and found that they're not losing their minds after all. "People who play action video games seem to make decisions faster than others without sacrificing accuracy," the Wall Street Journal's Robert Lee Hotz notes, "and practiced gamers are able to pay attention to more things at once without getting confused." Check out the WSJ's video, which is a refreshingly positive look at the industry we all love. Try to ignore the unavoidable admonition about violent video games toward the end. We're trying to stay positive here. This research is getting a lot of mileage. Might be the third article I've seen referencing it. Then again, my first reaction when seeing the image for this article was "SO MANY BANELINGS!" so I think I might just spend too much time around Starcraft. I could be a last ditch counter-attack after purple destroyed yellow (green? )'s base. It's clearly late game, mass banes at that point might mean that they don't have anything else. Games should be about wasting time, not teaching me things! If you suspect that you may be starting to learn during your gaming sessions, please remain calm. Save, quit your current application, and carefully load up some Call of Duty. Play until the sensation of learning or increase intelligence is numbed. If you continue to feel that you are learning during a CoD session, please see a medical professional. The thing about non-experimental psychological research is that there's just so many confounding variables. Do RTS games improve cognition, or do RTS games simply appeal to those who are on average more intelligent than the average person in the wider population? Starcraft improves multitasking? They had to do research to figure this out?